You are about to become one of the winners in your industry. 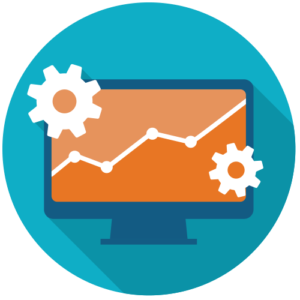 Using Dragon1 for data mining means you will see and cash opportunities, which others don't take advantage of. Read on to see how it works. In every organization there are many sets of managed and unmanaged data. Most of them are disconnected. Think of the business processes and the software applications. They are closely connected but their relationship and interdependencies often are not clear. The impact of changing one or the other is is therefore not transparent. Dragon1 as digital platform helps to combine all of these datasets, so you see opportunities you did not see before or even know of before. Imagine all the improvement and innovation you would see if you have all of these data managed and connected in your organization. Read more about the Data Mining Definition here. Data Mining: Just follows these four steps. First you define and set up your data sources. Make sure you know the data source holders and the quality of the data. Make sure you agree on a format in which the data is extracted or delivered from the data source. After you have defined your data sources it is time to collect and gather data from these sources, so you have something to work with. Here you use the Dragon1 import module to import the data, manually or scheduled. 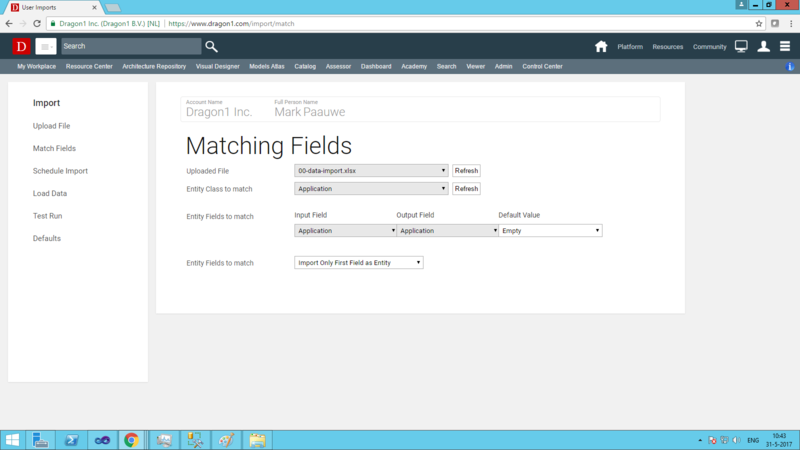 You collect data using the Import module on Dragon1 and you enrich the data using the Architecture Repository web application on Dragon1. Ok. So now you have imported managed and unmanaged data sets. Maybe just because of your work data sets on the loose have now become of higher quality. This is what attention does. Modeling means relating data: what is related to what. If you know which servers support an application and which applications support a process and which process produces a product and which product is bought by clients, then you know what products can be produced and sold if a certain server does not malfunction. And one million other things of course. Modeling on Dragon1 is done using the Visual Designer. 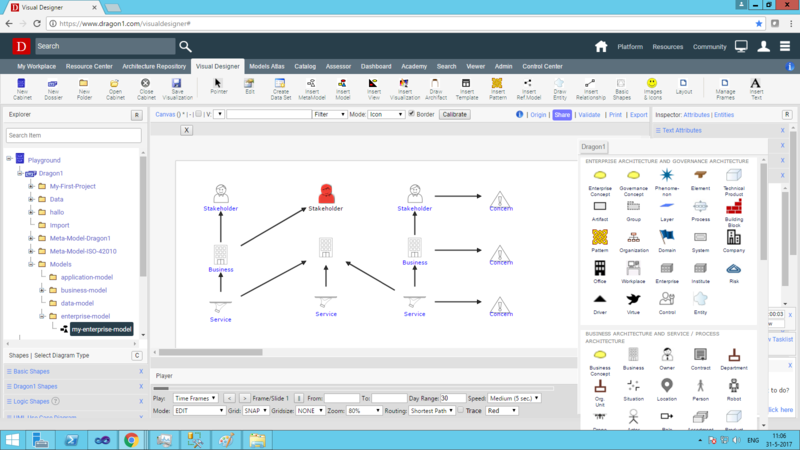 You can create (design or draw) metamodels and next user models. A metamodel is like the language rules and a user model is like a story written in that language. Your metamodels you can test the quality of your user models. An example is: If you draw in your product meta-model that every product in your company may only use fair trades materials, you can test every product module if non-fair trade materials are used. Or maybe you may only work with certified suppliers for certain materials, also this can be checked. How well you do this job all depends on your knowledge of metamodels. But of course Dragon1 has some reference models and templates to help you get going. A unique feature is that you can filter models on Dragon1. This is called creating views. Suppose a financial person is only interested in the financial data of a product model, but not in the process data of the product model, you then create a financial view of the product model. This makes the financial person more likely to use the model to support his decision making. Creating views are done in the Visual Designer. But there is more. After creating views you can link any number of views to a visualization (a canvas or a template) and decide which symbols are used to show to the data in the view or the model. You might want to visualize financial data with a financial icon to make things more effective. Creating visualizations are done in the Visual Designer. Suppose there are patterns and rules you want to discover. Why not have Dragon1 help you to see them. You can define patterns, rules and visual indicators that visually indicate if patterns are present in a visualization, or if business rules are followed or breached. Working with visual indicators is done on in the Visual Designer. After creating the wonderful good looking visualizations, views and models, people need to take action with them. 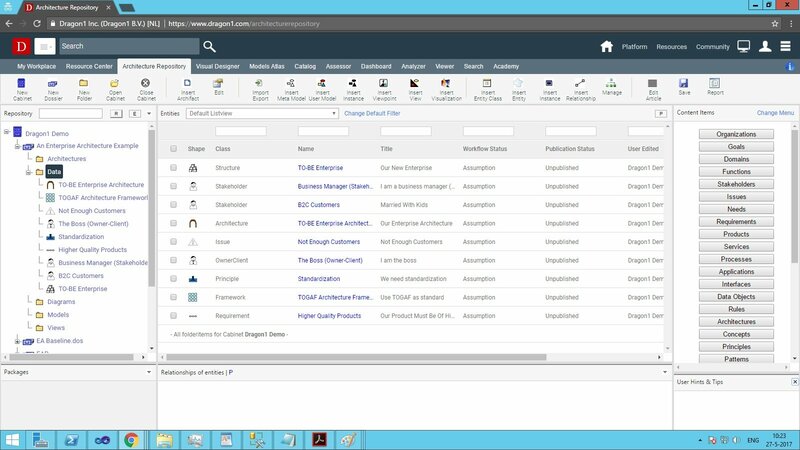 By publishing the data models in the Dragon1 Content Viewer you enable people to have access to them and make decisions with them. You see some example screenshots of Dragon1. We have grouped the screenshots here together and did not place them in the text above, so now the text above is better readable. Screenshot of the Import module. You can import any data from any data source. 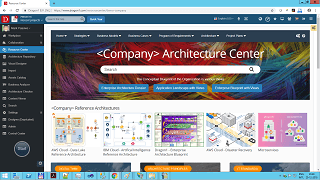 Screenshot of the Architecture Repository web application. Here you see that any type of data can be imported and placed together. At the right you have easy and quick access to certain types of data. 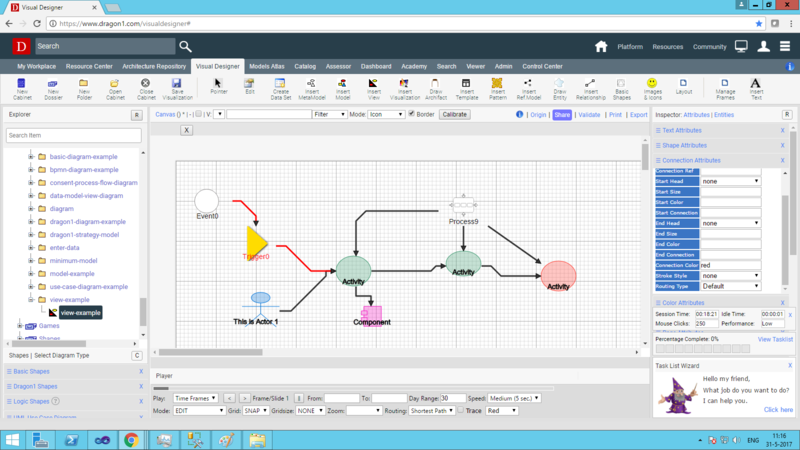 Screenshot of a model created of the data in the Visual Designer. You see that one of the stakeholders is colored red. That is because a business rule was defined that every target audience must have its own business. Screenshot of a view of a process showing an only flow of events and activities. The red color line indicates that a certain trigger is not fired after an event occurs. Based on the process log this could be spotted. Now the organization has an opportunity to improve this fault situation in the process. 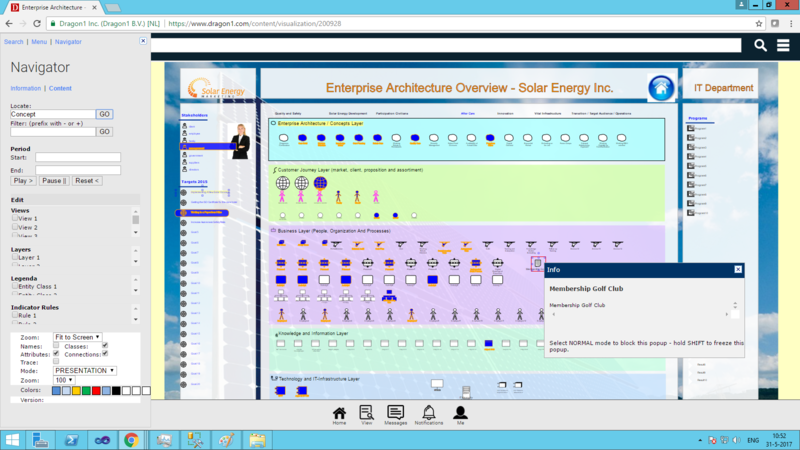 Screenshot of an example Enterprise Architecture Visualization as published in the Content Viewer. Here is where users can slice and dice the visualizations and see patterns. 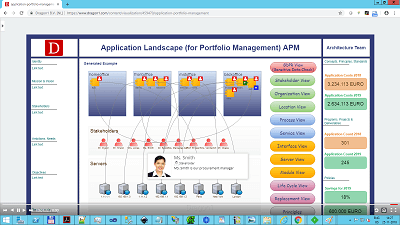 Dragon1 provides you with a template view layout that makes it easy to provide strategic and transformation context to any model or view. On the left-hand side of the picture there is room for strategic data, like goals and objectives and at the right-hand side of the picture, there is room for transformation data like projects and deliverables. And of course, this template is highly configurable. Providing such a context to your model or view makes it a better decision supporting diagram for executives. Use it wisely and where ever you can. 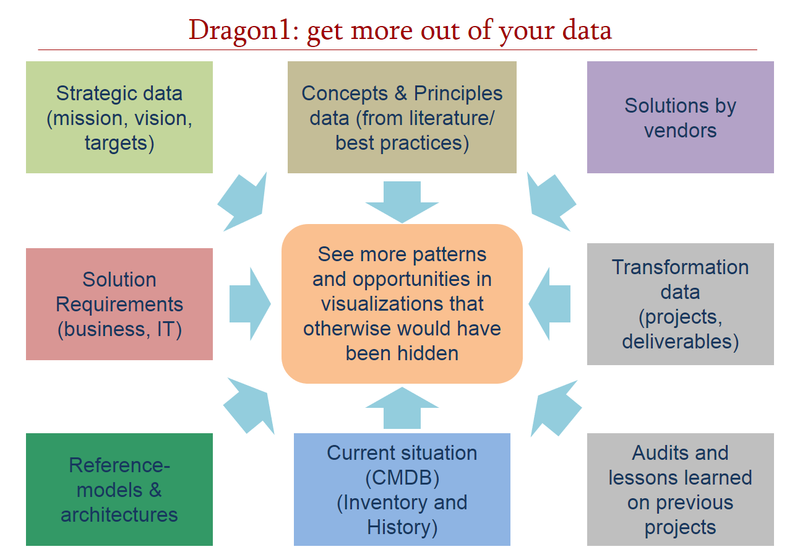 If you like what you see, then Dragon1 is the solution for you for data mining in a new way. If you have any questions, you can contact our sales via phone or email. You can also start immediately with data mining by purchasing a Dragon1 PRO user license. Good luck in spotting your overlooked opportunities and cash them!